Bow-Z, owned but John Hill, of Pella, Iowa, sits on the throne after being crowned the winner of the 39th annual Drake Relays Beautiful Bulldog Contest, Sunday, April 22, 2018, in Des Moines, Iowa. The pageant kicks off the Drake Relays festivities at Drake University where a bulldog is the mascot. A 2-year-old pup once destined to be euthanized was crowned the winner of Sunday's "Beautiful Bulldog Contest" at Drake University. 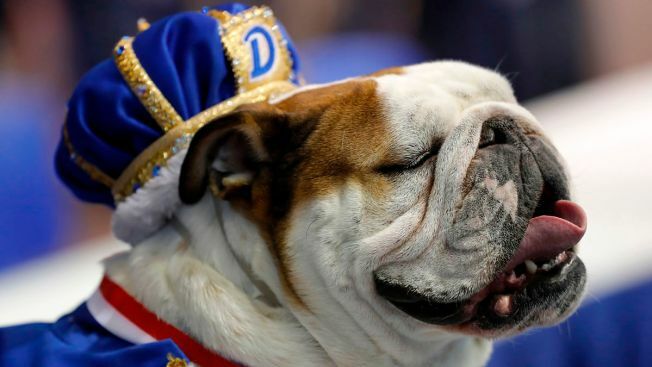 The 39th annual tongue-in-cheek pageant for English bulldogs, Drake's mascot, is the unofficial start to this week's Drake Relays track meet. This year's champion, "Bow-Z," hails from nearby Pella, Iowa. She was set to be put down as a puppy because of various physical ailments but was re-routed to a no-kill shelter instead. Bow-Z beat a field of 40 slobbering bulldogs — most of which were decked out in outlandish costumes — with names like Rocky, Tucker and Beau. The Drake Relays being in earnest on Thursday and wrap up on Saturday.